Located on quiet Lake Gogebic, surrounded by 960,000 acres of Ottawa National Forest, The Root Cellar invites you to experience the pristine wilderness and the reputation of the area’s BEST KEPT SECRET. It's a perfect place for a long weekend getaway. The Root Cellar has a lot to offer everyone who stays here. There is a newly built Inn with two suites & the most comfy beds around and 4 cabins with full kitchens. We can accommodate most size groups. The Root Cellar is directly on snowmobile trail #13 and ATV trail ES. We offer premium gas and oil, wireless internet, ATM on site and Keno and Pulltabs. The Root Cellar is centrally located and is a great starting and stopping point. 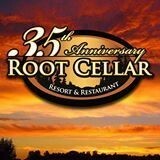 The Root Cellar's restaurant is known to be the finest dining establishment in the Western Upper Peninsula. Our restaurant, inn and cabins can accommodate banquets, weddings, reunions and retreats.